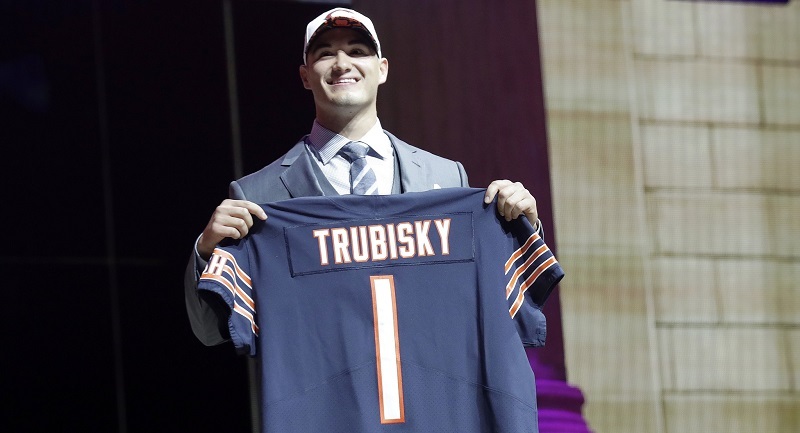 (1) The Bears made their draft about Mitch Trubisky and Ryan Pace staked his tenure on the success of the Tarheel quarterback. One can argue whether the Bears could have stayed pat at three and still ended up with their desired quarterback but Halas Hall did not believe that. They believed staying at three meant possibly losing out on the guy they refused to leave Thursday night without. (2) I got an email out of the blue Monday saying – essentially – “sounds like you boys are all-in on Trubisky”. I thought, “Okay, that’s odd.” Told Jahns. Told Dannehy. Went to a someone reliable around the Bears and they unreservedly confirmed it. Yesterday, once the Myles Garrett pick became official, I was 100% on Trubisky coming to Chicago. (3) This pick makes the entirety of the off-season program more interesting. OTAs, Bourbonnais, preseason games…etc. all become about Trubisky and his development. And for the first time in my life, I’m considering going to training camp for a few days. (4) Pace will try to get at least one of those mid-round picks back tonight. (5) I refuse to rule out Trubisky playing in 2017.